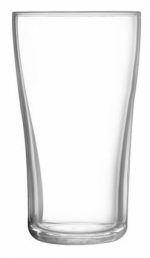 Midland Beer Glasses- buy in bulk and add your logo as well. No fuss, no muss- the Midland beer glass is a simple, straightforward design, but it's never boring because when you work with DejaBrew, we help you design custom branding to match your style. Then, we deep etch, imprint or decal it on every single piece you order. The Midland comes 24 per case and is for sale in 16 oz. and 20 oz. sizes.